Let's be honest. Spring is a tease. After some glorious weather a week ago, it seems that fickle Spring smacked us with cold, wet, and dreary. Want to show nature who is boss? Want to shake off the winter blahs? 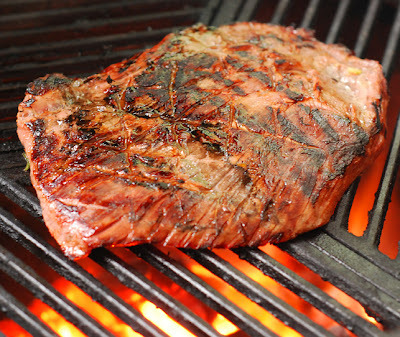 Then drag out your grill, fire it up and do something different! And oh yeah.....bring your wok. It is a fast dinner option. Most dishes on the wok take only a few minutes of prep and cooking. So break out of the same ol', same ol' and try using your wok on your grill. That is what I did tonight, I made a Grilled Orange Beef w/ Broccoli Stir Fire (aka stir fry). The steak by itself was pretty damn good but the rest of this dish is good too. 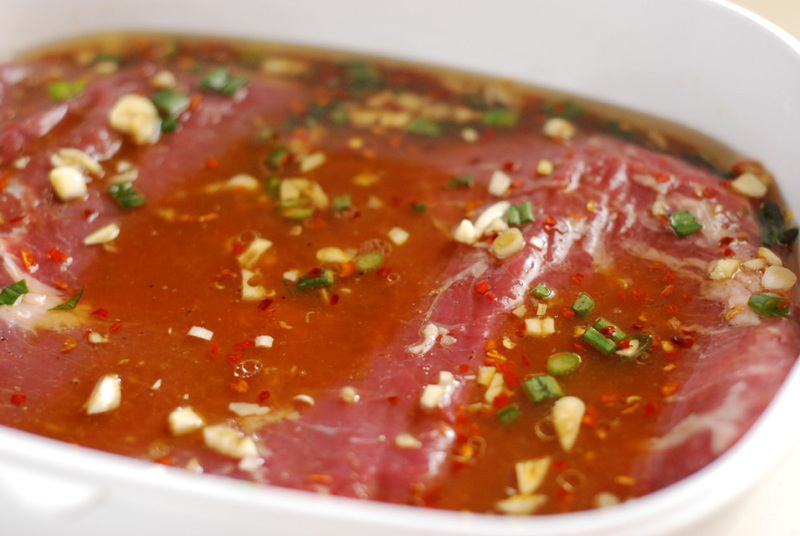 Mix the marinade ingredients together and marinate the steak for 3-4 hours. Set up the grill for direct heat at 400-450f. 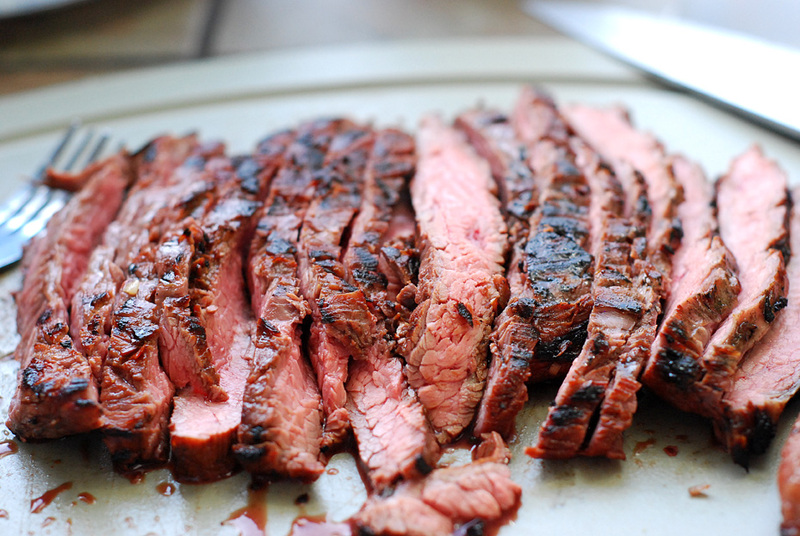 Grill the steak for 3 minutes per side (4 minutes per side if skipping the stir fire part). Remove to a raised rack and let rest. Since you will now be working with the grill top open, you will want to cut your lower air intake vents down to almost closed to keep your fire from burning out of control hot. Place a wok on the grill and preheat. This should only take about 1 minute. Add the oil and when it begins to shimmer add the shallot. Simmer for 30-45 seconds. Add the broccoli (still wet from rinsing) and stir fry for 2 minutes. Add the chicken stock, cover and steam for 4-6 minutes. Meanwhile, thinly slice the flank steak across the grain. It is so hard NOT to just eat it all at this point. But I did have to do some "quality control tasting.....errr....testing" of course. 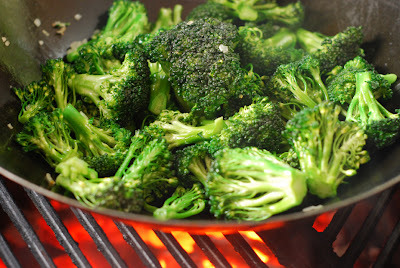 Remove broccoli. Add the oils and when hot, add the ginger and orange peel. Stir fry for 1 minute. Add the OJ, sherry, soy sauce, hoisin sauce, and stir. Allow to simmer for 2-3 minutes. Stir together the water and cornstarch and add to the sauce* to thicken. 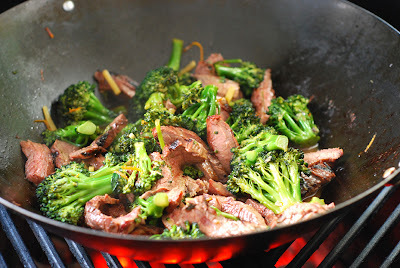 Return the broccoli and beef to the wok and toss them to coat with the sauce. Remove and serve immediately with rice. 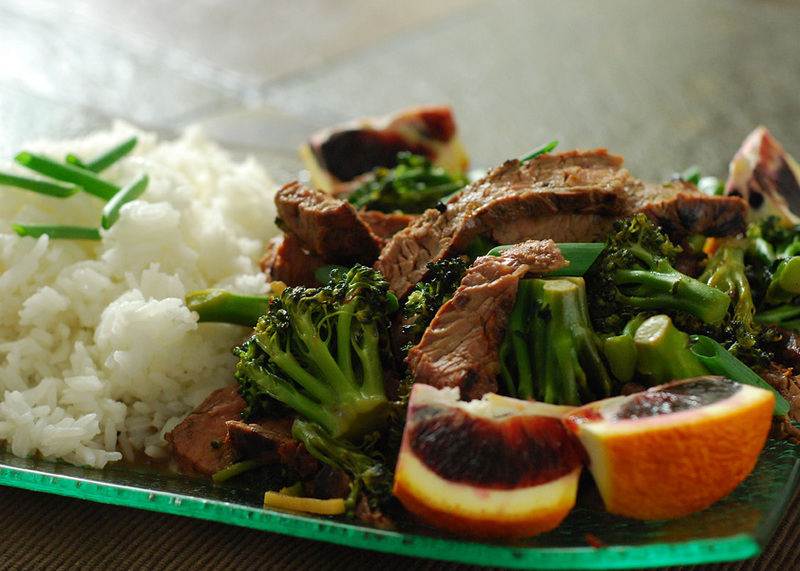 The beef and broccoli was good. It disappeared quickly, with my 11 year old having seconds. But the sauce seemed awfully thin, it just didn't coat like my usual stir fry does. After dinner I was cleaning up my out door kitchen, gathering things to be washed and there on the table was my unused bowl with the cornstarch slurry in it.........DOH! Mystery solved.